First, preheat your oven to 450F and grease your muffin tin. In a medium bowl add all your dry ingredients for the low carb biscuit recipe. And mix it all together, obviously lol. Next, add your wet ingredients. Mix it all up and portion out into nine sections of your muffin tin. I used a 1/4 cup, and it was the perfect amount. I recommend buying these ingredients Organic and grass-fed if possible. Dairy products and eggs are on the list of foods you should considering buying organic/grass-fed to avoid consuming growth hormones and other additives. If you are on a budget, I created an entire Buying Organic on a Budget Guide that will give you tips for saving money on organic foods and a whole list of foods you do or don’t need to buy organic, so you don’t waste money on unnecessary organic options! Bake the biscuits of about 10 minutes. While the low carb breakfast biscuits are in the oven, you can throw together the Keto sausage gravy. First, you will brown the sausage over medium-high heat. I always recommend buying organic meats as often as possible so that you're not consuming preservatives and other yucky stuff. With that being said, full disclosure we usually use Jimmy Deans Pork Sausage with sage, because this is our highly requested, go to breakfast when we are visiting family (non-ketoers). My husband is a chef so everyone always wants him to make breakfast and when providing them a list of ingredients we will need, Jimmy Deans is whats available at most grocery stores. My rule of thumb is for the meats I get on a daily basis buy organic, but every once in a while won’t have a significant impact on your health. Once the sausage is browned, drain any excess grease from the sausage then add cream cheese, heavy cream into the pan with the sausage and stir until it’s thoroughly combined. Then add the chicken broth, pepper and finely chopped sage (optional). The chicken broth will thin the gravy out, so I’d add half the amount and slowly add more if needed depending on how thick you want your Keto sausage gravy. At this point, your low carb biscuits should be done, and you can serve the Keto sausage gravy right on top of a biscuit! 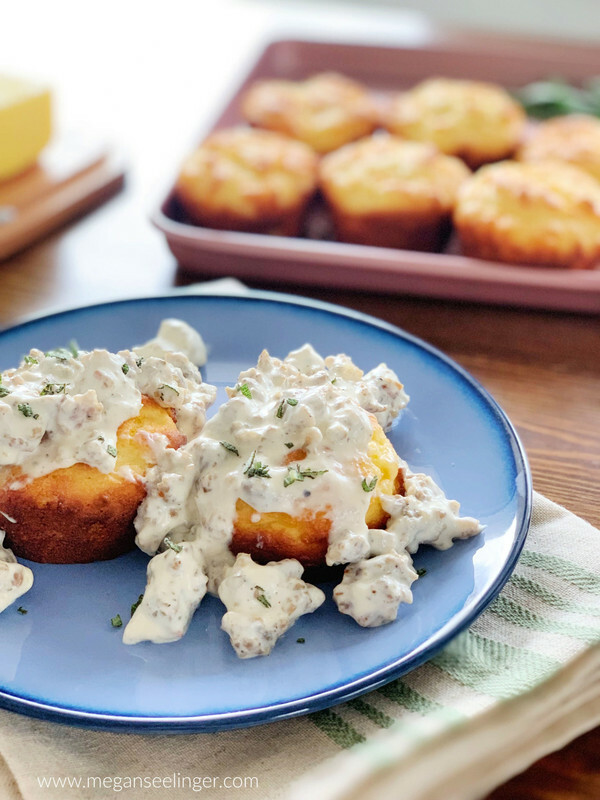 The recipe defiantly makes Low Carb Biscuits and Low Carb Gravy 5.3g Net Carbs per serving to be exact, however, I recommend having this recipe here and there to enjoy some good ol' sausage gravy and biscuits, while still sticking to your low carb, Keto diet. BUT due to the overload of dairy and the amount of fat (50.5g per serving) and protein (20g per serving) I wouldn't recommend eating this for breakfast every morning. I recommend having this recipe here and there to enjoy some good ol' sausage gravy and biscuits, while still sticking to your low carb, Keto diet, however, due to the overload of dairy and the amount of fat and protein per serving I wouldn't recommend eating this for breakfast every morning.